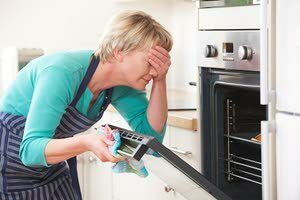 Got a holiday kitchen disaster? We’ve got a fix for that! The turkey isn’t done. So your guests arrived two hours ago, but the turkey has barely broken 125 degrees F. Now what? Maybe it’s time to check the movie listings? Just kidding. Sort of. This is a hard fix, but it’s not impossible. Start by making sure you are getting an accurate read on the turkey’s temperature. Use an instant thermometer inserted at the leg/thigh joint, and make sure the probe doesn’t hit bone. Next, pull the bird from the oven and increase the temperature by 50 degrees F. Cover the turkey with foil, then return it to the oven. Check the temperature every 30 minutes, but no more than that. More frequent opening of the oven lets the heat escape, further slowing the cooking. Once you are within striking range of your target temperature (155 degrees F to 160 degrees F), remove the foil to allow for browning (unless the bird already was sufficiently golden). How to avoid this next time? Plan better. For example, if it is recommended that you roast your 16-pound turkey at 325 degrees F for 3-1/2 to 4-1/2 hours, assume it’ll take the longer estimate. But even so, start checking the internal temperature on the early side, after about 3 hours. If the turkey’s not done, keep checking at 30-minute increments until it registers about 160 F. (Remember, the temperature will continue to rise to the needed 165 F while the bird rests). The turkey is done too soon. If your turkey gets to 160 degrees F and your guests have not arrived yet, don’t fret. The turkey needs to rest, covered loosely with foil, before carving, for at least 20 minutes. And it will stay rip-roaring hot for up to an hour. The turkey is dry. Turkey tends to be flavorless enough as it is, never mind when it is overcooked and dried out. To fix a dry bird, heat the oven to 300 degrees F. Carve the meat off the bird, slicing it as you would to serve. Arrange the slices, slightly overlapping, in a shallow baking pan, then pour some turkey or chicken broth over them, enough to come halfway up the sides of the slices of turkey. Cover the pan tightly with foil and heat the turkey for 10 minutes, or until it’s heated through. The turkey isn’t carving nicely. Sometimes when you carve the bird, much of the breast meat remains on the bone. There is a reason this happens; it’s the wishbone, which blocks the knife from slicing all the way done to the rib cage. So get the wishbone out of there, then get back to carving. And the best way to carve is to start by cutting the whole breast off the carcass, removing one half-breast at a time. Then do your slicing. The beef or pork is overcooked (or cold). This one is easy. Start by heating some of whatever gravy you have on hand. If it appears there might not be enough, stretch it by adding a little beef or chicken broth (or, in a pinch, water). Slice the meat thin, arrange it in overlapping slices on the serving plates (do all of this out of view in the kitchen), then pour a liberal helping of hot gravy on every serving. The sauce looks greasy. This is because the fat and other liquids are starting to separate. Just return the sauce to the pot over low heat and whisk in a little water. It should become emulsified and smooth again in no time. The gravy is lumpy. Pour the gravy through a mesh strainer and discard the lumps. Alternatively, portion the gravy into a blender in batches and puree until smooth. But when working with hot liquids, never fill a blender more than a third full. The green vegetables are overcooked. Pop the vegetables into the food processor and pulse until they are finely chopped. Now mix them into the mashed potatoes, rebranding the dish as “Brussels sprouts potato mash.” And by the way, that example is particularly delicious if you happened to toss some bacon in with the overcooked Brussels sprouts. The pie falls apart or the crust crumbles. Spoon it into wine glasses in alternating layers with a bit of ice cream or whipped cream and call it a pie trifle. The whipped cream is over-whipped. If the whipped cream starts to look dry and grainy, just add a little more cream and carefully beat it until soft peaks form. Then stop. You’re done. The cake is dry. Make a simple syrup by combining equal parts sugar and water and heating them in a saucepan over low heat until the sugar is dissolved. If you want to flavor the syrup, add vanilla, lemon zest or juice, orange zest or juice, brandy or another liqueur. Brush the syrup liberally over the layers of the cake before assembling. Or slice the cake and drizzle the syrup over each serving. The cake/cheesecake/pumpkin pie is cracked. You can camouflage the cracks by decorating the top of the dessert with lightly sweetened whipped cream (preferably piped on using a decorative tip) or by dusting it with powdered sugar shaken from a mesh strainer. And if you want to get fancy, pick up a paper doily ahead of time. Place the doily over the cake and dust with powdered sugar over that. Beautiful! Either quick fix should be done at the last minute because the whipped cream eventually can get watery and the powdered sugar will weep if it sits for too long on top of the cake. The rolls are burned on the bottom. Perform a taste test. Using a serrated knife, slice the bottom off one of the rolls, then taste what’s left. If it tastes burned, toss them. If it tastes fine, slice the bottoms off all of the rolls, arrange them in a single layer in a basket, bottoms up, and spread softened butter on the cut sides. Serve them hot and call them hot buttered rolls. There are really only two kitchen errors that can’t be easily repaired. If something is burned — and I don’t mean just singed or browned on the bottom — it’s going to taste bad pretty much no matter what you do to it. You could try telling your guests that you smoked it, but the chances are they’ll know the terrible truth. Your only real choice is to toss it out and serve more of the dishes that weren’t burned. Or order out for pizza.